1. Am I the only one that ripped their tree down December 26? Don't get me wrong. I lurve Christmas and the Christmas season. This one, especially, seemed really fun and festive. Howevs. When it's done...it's done. My house is laid out pretty choppy-like so losing that corner to a tree, even if its just for a month, seems to make a difference! But worry not. I still have this little guy greening up the den. And, yes, I've discovered PicFx on the iPhone and can't get enough of the bokeh feature. And, yes, you might not really be able to see the little guy to well because A) the lighting in my den is a touch orange and B) I took the pic whilst laying on my couch across the room instead of getting up and walking over to it. I started being lazy at about 3pm on Christmas Day and it hasn't really let up since them. ANYWAY. 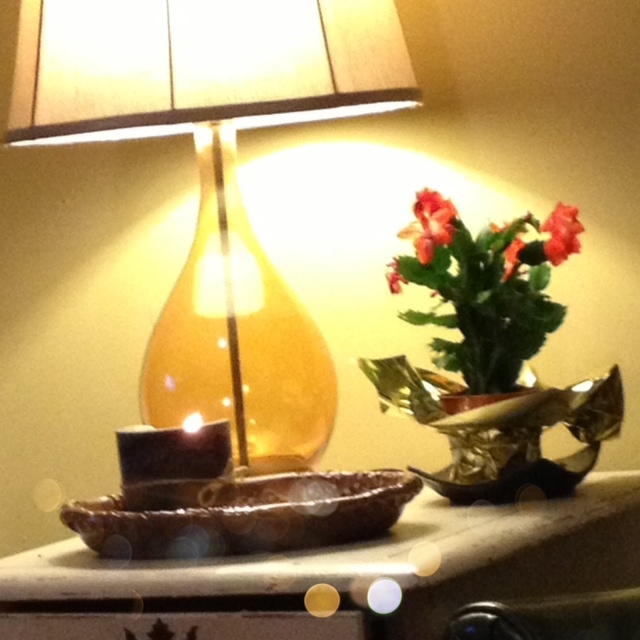 It's a Christmas Cactus! And I want it to live and grow and thrive! Anyone got any suggestions? It's got a little wilt action going on right now. According to my green thumbed friend Brantley, snipping said wilt action should help. So that's what I did. 2. I should probably spend less time playing on iPhone photo editing apps and rambling on about my Christmas Cactus and more time reading my book, Life of Pi. Eeeeeeeee it's so good. But sometimes, a girl just likes to ramble. 3. I really don't like to do a lot of regretting of things. However, I threw my snuggie away in a fit of cleaning induced craziness and I am really regretting it since this sharp drop in temperature. I get it. On the grand scheme of things, this is really a non issue. But I'm still a little chilly. 5. Guys. We got New Years coming up. What are ya'll doing? More imortantly, what are ya'll wearing? I'd like to don (done? dawn? help.) something with a little sparkle to it. I was going to order this super cute sequined skirt but it wasn't going to get here until after the New Year. I don't know about you but I don't have a ton of events coming up that would require I wear a sequined skirt, so there you go. Once upon a time, I ordered a super cute one shoulder sequins number from the Forever 21. Now, I don't have any business ordering anything from Forever 21 because I am (proudly!) a gal with curves and (proudly!) a gal that doesn't love dresses creeping up to no mans land while in public. This dress not only overly hugged said curves and creeped all night long but also rubbed me raw. Sequins under the arm aren't really the best idea. If you tool around on my Facebook albums long enough, you'll find a picture. Happy weekend dear friends! Take care and do something awesome! LM, you are so funny.